This was a meal that started out as one idea and morphed into something a lot different than the original dish I intended. I was going for the classic Chinese dish Ma Po Tofu, with eggplant substituted for the bean curd. Instead, I ended up with a funkier kind of pork stir fry that was heavily influenced by the ingredients I was able to find at Publix. I have been a big fan of Ma Po Tofu ever since having it for the first time at Gu’s Bistro (RIP) on Buford Highway a few years ago. At the time, I had just read a big article about Sichuan cooking and was looking for some of the more authentic stuff in town. An adventurous buddy and I headed to Gu’s, but don’t give us credit for being intrepid explorers – the restaurant already had a lot of buzz and was considered a Buford Highway destination. As we looked at the typically overwhelming menu of Sichuan specialties, Thomas (whose hand you can see holding a bagel in this picture!) recommended ma po tofu. I was skeptical because tofu is for smelly dudes playing in an Asheville drum circle, but I was pleasantly surprised with the dish that came out. It was hot, with that special Sichuan mouth-numbing spiciness, and the silky tofu struck a great balance with the saucy pork. It instantly jumped to the forefront of my future takeout orders. Now, for whatever reason, it seems like ma po tofu has pushed its way into my consciousness again. There’s no specific reason – I’ve just seen a tweet about it here, an updated recipe there, and suddenly had a craving. 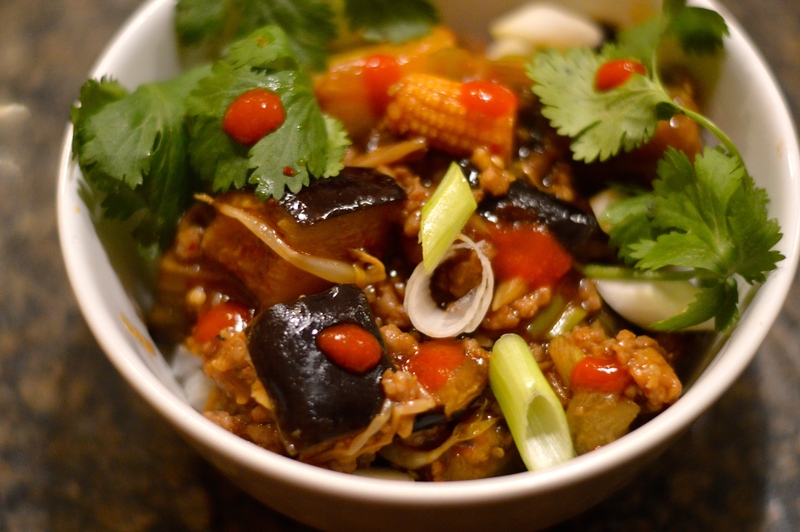 One post that caught my eye was an Andrew Zimmern recipe for ma po eggplant. The substitution was interesting and made sense to me. I’ve also never cooked with tofu before, so I decided to pursue the eggplant direction. Along the way to this meal, I kept making decisions or being forced into ingredients that took me farther and farther away from my original idea of ma po eggplant. First, the Publix I went to didn’t have plain ground pork, so I got mild Italian sausage. I think that caused my final dish to be a little too salty. I also decided to throw in a can of stir fry vegetables I saw in the ethnic foods section – I can’t resist baby corn, but they are not usually in ma po anything. I also couldn’t find any spicy bean paste, so I went with Thai chili garlic paste instead. Obviously not Chinese. So, maybe calling this Ma Po Eggplant is disingenuous, but I can’t really be bothered because the final result was delicious. 1 large eggplant – 1 1/2 to 2 lbs. Cut eggplant into one-inch cubes, toss the cubes with lots of salt and let sit in a colander in the sink for 30 minutes to an hour. This is a good time to prepare your other ingredients. When you’re ready, rinse and dry eggplant. Position oven rack four to six inches away from the broiler; heat broiler on high. Toss eggplant with one tablespoon of peanut oil and spread cubes out on a large sheet pan. Broil for 10-15 minutes until eggplant is charred and softened, tossing and flipping the eggplant once or twice during broiling. 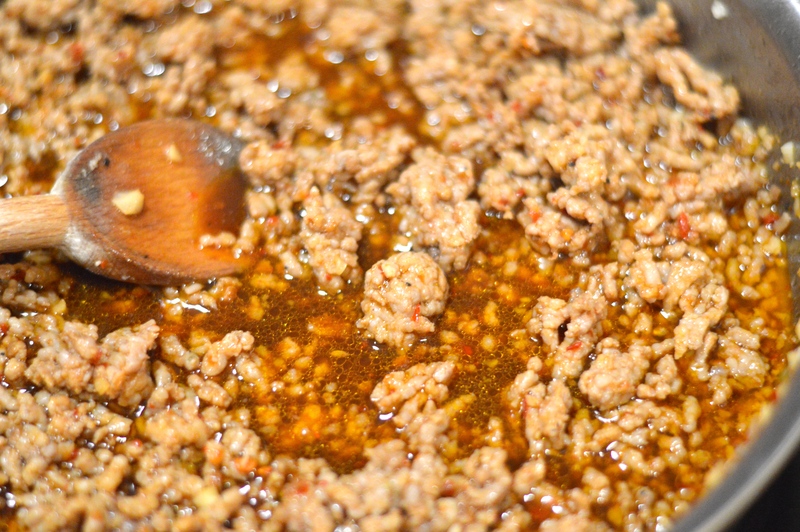 To make sauce, combine chicken broth, soy sauce, chili paste and fish sauce in a small bowl and whisk. In a large skillet or wok over high heat, add two teaspoons of peanut oil. Stir fry the pork for 5-10 minutes until it is grainy and has lost any traces of pink. Reduce heat to medium, then add sauce and stir fry vegetables and stir, bringing to a boil. When eggplant is finished in the oven, gently slide it into the pork and vegetable mixture. Whisk together cornstarch mixture and add to the pan, bringing to a boil and stirring constantly. The sauce will thicken after 10-30 seconds. Add scallions, reserving some for a garnish. Serve stir fry over steamed white rice garnished with cilantro, sriracha and extra scallions.